On Sunday, I did something I’ve been wanting to do for years1 – I learned how to curl! 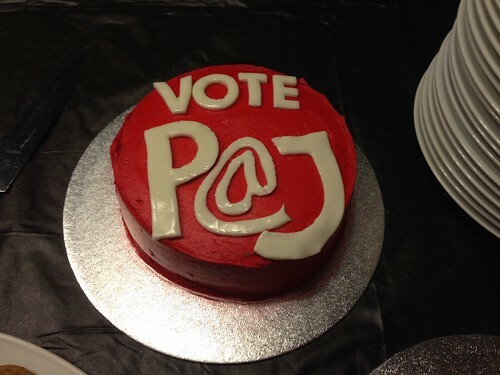 It was all part of a FUNdraiser for my friend, Patrick Johnstone, who is running for New West City Council in next month’s municipal election. 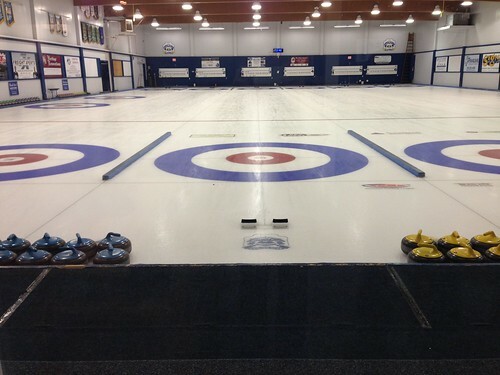 Ice at the Royal City Curling Club, waiting for us to start our curling lesson! 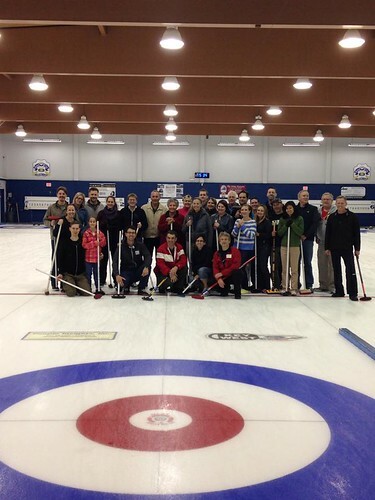 The event took place the Royal City Curling Club. We got a chance to learn some of the curling basics – how to throw the stone so it goes where you want it to go, how to sweep the ice to get the stone to go further and straighter, how to walk on ice without falling – all the important curling skills2! After practicing all of this stuff – which was far more complicated than one would expect just from watching the game – we got to play two ends, with a little bit of help from a coach (because honestly, I had no idea how to tell if the stone was going fast enough to get where we wanted it to go (and thus we shouldn’t sweep) or if it was going too slow and sweeping was needed). Our game was a close one – my team won 3-1 after the two ends3. Group shot of all the curlers for the day. I have to say, curling is a lot more fun to play than it is to watch and as with many things, I’ve gained a new appreciation for the sport now that I’ve tried it myself4. After all that, there was delicious food from Re-Up BBQ and beer from Steel & Oak – two fantastic local New West businesses – and a chance to chat with other New Westies. Most importantly of all though, this was a fundraiser, and it was really great to see a sold out event in support of Pat’s campaign for city council. I’ve been helping out on Pat’s campaign5 in the form of door knocking with him6, because I think he’ll make an excellent city councilor. He’s really passionate – and extremely knowledgeable – about New West. And I really like his approach – as we’ve been out door knocking, he’s asking New West residents what their concerns and ideas for the city are. He listens to people and he answers any questions they have for him in a direct and transparent way7 – and when he doesn’t know the answer to a particular question he says “I don’t know, but I will find out for you.” He bases his position on any given subject on reason and evidence – and when there’s not enough evidence available he says “We don’t know enough to make an informed decision. X is the evidence we need to make an informed decision on this and Y is where we’d need to get that information” That’s the kind of approach that I would like to see in my government – receptive to the publics concerns, reasoned and evidence-based decision making, and transparency in the process. Anyway, if you are a New Westie, I encourage you to check out his campaign website for more information on his campaign and to donate!